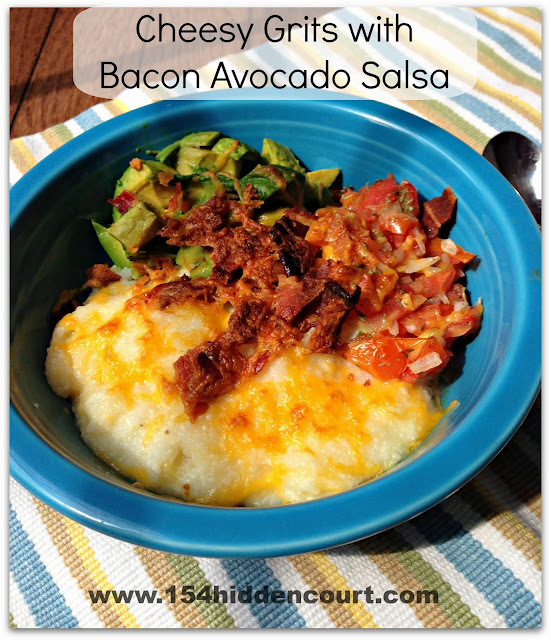 154 Hidden Court: Cheesy grits with bacon avocado salsa. Cheesy grits with bacon avocado salsa. I have a confession - I'm a late in life grits convert. You'd think that my southern country upbringing would have ensured that I grew up on a steady diet of grits for breakfast, lunch and dinner, but it just wasn't something our family ate. As a matter of fact, it was my city-slicker husband who introduced me to grits for the first time, and I've never looked back. My boys love them too, and now they're a regular part of our breakfast menu. I remember a quote from the book The Help where Aibileen says "Grits is just a vehicle for what you really want to eat, anyways," and I take that to heart every time I make them. They can be sweet or savory, bland and comforting or spicy and energizing, and they're perfect and hearty and filling for the cooler fall weather we're (finally) having. 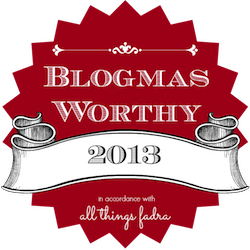 When I saw that Kristen at Dine and Dish was hosting a Wake Up Breakfast with California Avocados, I knew I needed to enter my favorite grits recipe in the giveaway. Although I'm not a food blogger by ANY stretch of the imagination and although that picture you see was taken with my iPhone just seconds before I devoured it - it really was my breakfast for the day - I thought this was too good not to share with avocado lovers of the world. Mix all your salsa ingredients and set aside. Next in a medium pot, bring the four cups of water to a boil. Add a couple dashes of salt, then slowly stir in the grits. Bring to a boil again, then reduce heat to low and cover. Cook for 5-7 minutes, stirring occasionally. Preheat your broiler to 450 degrees. After the grits are done, stir in the butter and half the cheese, until melted. Divide the grits into four oven/broiler safe dishes, and top each one with 2 tablespoons of salsa, 1 slice of crumbled bacon, and 1/2 of a diced California Avocado. Top with the remaining cheese and place in the broiler for 3-5 minutes, until cheese is melted. YUM YUM! I love grits and have never made them. I'm not from the south so this is no surprise, but I could eat them in any form and usually do if they're on the menu. And I agree: they are the perfect comfort food for chilly mornings.